Barrier Security Products have added to their shock absorbing range of products with the new shock absorbing guard rail. The shock absorbing guard rail is able to shift sideways if hit at or near ground level. If the impact is higher up, the shock absorbing guard rail can tilt up to eight degrees, at which point it locks in place, offering maximum protection. Shock absorbing guard rails are designed to be used anywhere vehicles are manoeuvring at low speeds, such as car parks, factories and warehouses. Shock absorbing guard rails have a self-centring design, making them able to take repeated impacts without incurring permanent damage. Shock absorbing guard rails simply absorb impact and return to their original position without damaging floors. These unique characteristics result from the combination of clever engineering and the use of high tech composite materials. 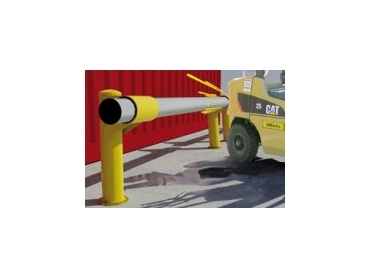 Shock absorbing guard rails posts are available in 140mm diameter in either core drilled in-ground or surface mounted models. Rails are 140mm in diameter and available in lengths up to six metres.